When you want it done right the first time! If you just need a New York State Inspection, an oil change, a brake job, an entire engine or transmission overhauled or replaced; or if your vehicle has an electrical or computer problem that’s driving you crazy, 14th Road Parkway can provide the solution and get you back on the road quickly. ASE is a society of automotive engineers that tests and certifies the skill level of automotive technicians in all phases of repair and service. To maintain their certification, technicians are retested regularly so they have to keep up to date on the latest technology. 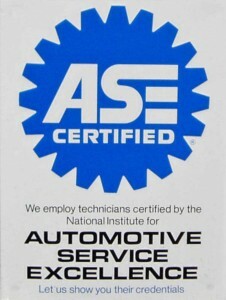 Parkway Service Center takes pride in employing ASE certified technicians. Ask about an Extended Warranty for your car! Hosting by ZJS Technology, Inc.